Hiring a coach for your corporate of business event has never been easier, one call to National Coach hire will provide you with a multitude of options from standard to full executive coaches ranging from as little as 8 seats right up to double Decker coaches catering for 80 passengers at a time, we can also organize refreshments, catering and hospitality if required. We can organize transport for large groups into the thousands, your account manager will oversee every detail from start to finish, this enables our clients to focus their attention on other parts of the event and leaving them one less thing to worry about. We are more than happy to discuss recent coach hire movements that we have carried out for large groups sometimes implementing the same strategies that we have done in the past for your forthcoming movements. 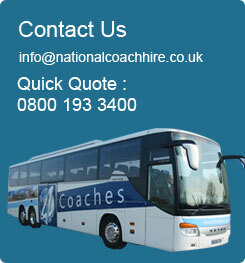 Contact us today to discuss you requirements, we are not only a coach hire company we are also a solution provider.